WP Calc Finance is a WordPress plugin that includes the entire list of tools for calculating consumer loans, microloans, mortgage loans, car leasing, MTPL insurance, and so on. This extension is suitable for owners of financial, automotive and other sites. 1. Easy installation. The plugin is installed in the standard way in the administrative panel of the site. All that is needed is to download the paid archive and install it, as is done to install the numerous extensions available today for WordPress. Then there will be only to activate its license and the plug-in will be fully ready for use. 2. Easy to set up. A huge list of settings allows you to adapt the displayed settlement tools to any site design. In addition, WP Calc Finance integrates perfectly into adaptive site templates, and its tools are beautifully displayed in mobile versions of Internet resources. Customized fonts, background colors, buttons, border colors and other graphic elements are available. 4. Ease of withdrawal. The conclusion of calculators on the pages of the site is made with a shortcode, which can easily be placed anywhere on your Internet resource. 5. Export data to PDF and the ability to display the watermark. These options allow site visitors to download the received data on calculations. For example, payment schedules for a loan in a PDF file with the indication of the domain in the form of a watermark. This will allow your site to add credibility in the eyes of visitors and remind yourself once again. 6. Convenient way of monetization. 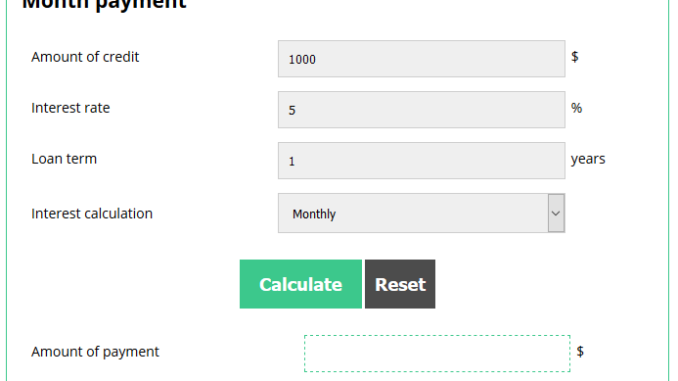 To increase the profitability of your site in the settings of WP Calc Finance provides the option of displaying ad units and any banners directly in the form of a displayed calculator. This will help to focus users’ attention on the broadcast advertising, increasing its clickability. So, if you do not have the time, the will and the energy to create your own financial calculation tool, WP Calc Finance is your solution! The plugin will save you a lot of financial resources, time and effort and will increase the behavioral factors of your Internet resource.